Welcome at Hap Spots, the worldwide spots of happiness. This site is under construction. You can find here more information and background of this international project. 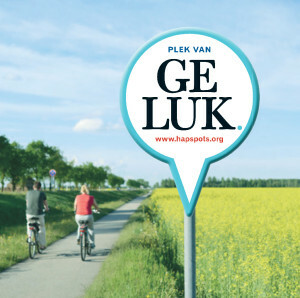 You can let us know your own Hap Spots or ask us to create together a City of Happiness, with at least 20 Hap Spots in your town. Schagen (NL) Information in Dutch available. Tilburg (NL) Information in Dutch available. Hap Spots is a registered mark. The project is under supervision of Leo Bormans, Ambassador of Happiness & Quality of Life, author of the worldwide bestseller The World Book of Happiness. Let’s hope Happiness Spots improve our happiness a little bit, wherever we are.